Haven’t decided on a hotel yet? You can look at other available hotels in the regions Piedmont and Lombardy with Booking.com. 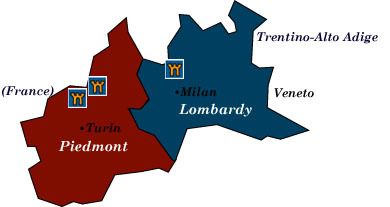 Lombardy takes its name from the Lombard tribe that invaded the region in 568 AD. It’s geography determined its historic fate, as Charlemagne, the Franks, the Austrian Habsburgs, and Napoleon conquered in turn. More akin to northern Europe in pace and work ethic, Lombardy is Italy’s richest and most industrialized region. Neighboring Piedmont leans a bit toward France in culture in style. Beginning in the 11th century, the feudal French Savoy family dominated the region off and on for several hundred years. Napoleon’s army (and relatives) had a go as well. Piedmont’s landscape is dotted with castles near the Valle d’Aosta, which makes a natural corridor for armies from the north to enter Italy. Milan If you’re traveling about northern Italy, sooner or later you’ll pass through this sprawling, industrial city. Spend a day or two to visit the cathedral (Duomo), which is one of the largest in the world. Construction began in 1386 and finished in 1809 under order of Napoleon. Housed in a palace, the Brera Picture Gallery (Pinacoteca di Brera) is rich in works by Mantegna, Raphael, Bellini, Rembrandt, Goya, and Caravaggio. The Church of St. Mary of Grace (Santa Maria delle Grazie) is home Leonardo da Vinci’s The Last Supper. Opera aficionados always enjoy a few hours at the La Scala Theatre Museum (Museo Teatrale alla Scala), a fascinating look back into the history of La Scala. The Lake District One of Italy’s most glorious regions, the Italian Lakes evoke romantic, fairytale-like vistas of blue waters at the foot of noble mountains, aristocratic villas, and terraced gardens overflowing with brilliant flowers. Each lake exudes a different atmosphere: Lake Como boasts precious, flower-filled villages, dreamy gardens, and castles and villas; Lake Maggiore, known for its legendary beauty, has an extraordinary variety of lush vegetation and exclusive lakeside villas; Lake Orta, one of the smallest of Italy’s lakes, enjoys a mild climate, while the shores of Lake Garda, the largest, are covered with vineyards, cypresses, citrus, olive, and palm trees. Lombardy’s Renaissance Cities Surrounded by 16th-century Venetian walls, the Upper Town of Bergamo is filled with architectural treasures. Off the Piazza Vecchia, the Palazzo della Ragione is the oldest communal palace in Italy, dating from 1199. Aldous Huxley called Mantua the most romantic city in the world (well, perhaps an exaggeration), but the Ducal Palace (Museo di Palazzo Ducale), with its 500 rooms and 15 courtyards, should appeal to subscribers of the “more is better” lifestyle. Finally, Cremona, known as the home of the world’s most exquisite violins—the Stradivarian Museum is a good start—also hosts a magnificent cathedral (Duomo) with its Torrazzo, a beautiful campanile that is the tallest in Italy. Turin (Torino) Site of the 2006 Winter Olympics, this gracious city also plays host to the famous Shroud of Turin, which is tucked away in the Cattedrale di San Giovanni and seldom shown. The world-class Egyptian Museum (Museo Egizio and Galleria Sabauda) has an outstanding collection of Egyptology second only to Cairo and London, while the Galleria houses the extensive art collection of the House of Savoy. Gourmet Delicacies! Foodies should make the pilgrimage to Alba and indulge in its delicious tartufi bianchi (white truffles) and wild mushrooms. Ski Resorts In this region of Italy, you’ll find ski resorts galore with some 400 km of slopes. Among the best are Sestriere, Claviere, Sansicario, Cesano Torinese, and Sauze d’Oulx.